We will first inspect your property to get a sense of your your landscape. After pin pointing the sensitive areas of your site we will develop a treatment plan that will give you and your family maximum protection. 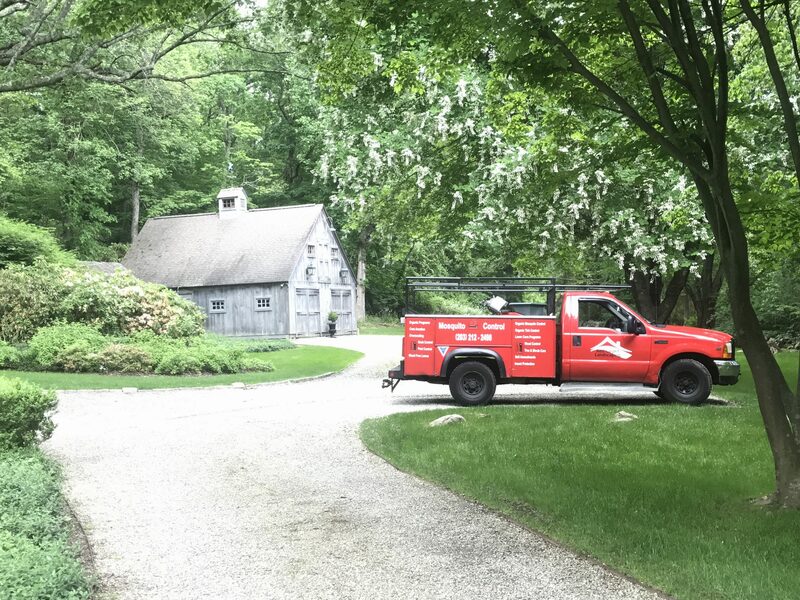 After we generate a plan and have your approval, we’ll visit your property and maintain our pest treatment plan up to 4 times during the season. This service program will provide your children, yourself and your pets a season long protection. Each visit will be spaced approximately 35 – 55 days apart. There is no odor and extremely successful in controlling mosquitoes in your yard. Treatment areas may contain; Lawn areas, landscape beds, trees & shrubs, under decks and 20 – 50 feet beyond your property perimeters (if allowed). Licensed & Certified technicians to apply treatments. The products we use are extremely effective in immediate knockdown of these pests. Depending upon the pressure of mosquitoes multiple treatments may be required. Ponds & other standing water bodies may be included in our treatment plan to help eliminate the larvae from maturing into adults. We’ll first check your property to get a sense of your your landscape. After pin pointing the sensitive areas of your site we will develop a treatment plan that will give you and your family maximum protection. After we generate a plan and have your approval, we’ll visit your property and maintain a barrier on your turf and into tall grass as necessary, up to 4 times during the season. This service designed to combat the growing problems with Ticks in Maine. Fleas will also be controlled with this service program providing your children, yourself and your pets a season long protection. Each visit will be spaced approximately 35 – 55 days apart. There is no odor and extremely successful in controlling ticks in your yard. Two of the more worrisome ticks found in North America are the American dog tick and the deer tick. The American dog tick feeds on a variety of warmblooded animals, including dogs and humans. It has been known to transmit Rocky Mountain spotted fever and other diseases from animals to people, and can even cause paralysis in children. The deer tick is much smaller than the American dog tick (slightly larger than a pin head), and is responsible for the spread of Lyme disease among humans. Lyme disease can be carried by mice, dogs, cats, raccoon’s and squirrels. Deere ticks pick the disease up from these carriers and transmit it to people with their bites. Research shows that most bites occur in people’s own lawns. Symptoms of Lyme disease include a bulls eye shaped rash, headaches, fever, chills, nausea, fatigue, muscle and joint pain, and swollen glands. In later stages of the disease, arthritis, nerve or heart disorders, meningitis, encephalitis and facial paralysis can occur. Properties located next to heavily wooded areas, and those with an abundance of trees and shrubs in the landscape, are especially prone to tick infestation. We can help to keep ticks out of your yard with our professional treatments, paying special attention to your lawn and any shrubbery. We’ll be happy to provide an inspection of your property to determine the best strategy for keeping ticks out of your yard. Mosquitoes are resilient pests that will not only ruin your outdoor experience, but also carry dangerous vector-borne diseases. Our most popular mosquito control treatment is our barrier protection spray program. We can help reduce the mosquitoes on your property this year. we start by checking the entire area to eliminate standing water that mosquitoes need to breed. we then apply a barrier spray to specific areas in order to repel mosquitoes in the future. Our barrier spray is re-applied a few times through the summer season, and can be applied prior to special events as well. Sign up for one of our Turf Programs that includes both standard and organic fertilizer and weed programs for a perfect lawn!